I know, I know. Right now, all blogs, including mine, are supposed to be all about turkey, apples, pumpkin, cranberries and other holiday foods. Well, I WAS going to do a variation on pumpkin pie that I found online, but as I mentioned on my facebook page, it sucked. I mean, this was horrid. We ended up throwing out half of it and this is a household that can never get enough pumpkin pie, so that alone tells you something. So, for the last few days, I’ve been racking my brain trying to figure out what to post. The problem being that my brain is on hiatus due to a cold. Last I heard from it was a postcard saying it was in the Cayman Islands, sitting on a beach, soaking up the sun while drinking a Mai Tai. Damn brain…always leaves when the going gets tough. Did I mention that this recipe uses cooked chicken, a la store bought rotisserie or leftover home cooked and that you could very easily swap out cooked leftover turkey in here? So see, I HAVE done something that is perfect for Thanksgiving. Well, the day after anyway. Serve some pumpkin pie for dessert and it’s like Thanksgiving all over again. This was my way to use up leftover roast chicken we had. I had made two chickens because well…males. But then my 17 year old stayed at a friends house and we ended up with a ton of it leftover. I looked at a few recipes for chicken enchiladas but none of them appealed. I’m not a fan of cumin or coriander used plain (though I like them in blends) so I just threw this together my way. This isn’t difficult at all. Just saute your onions and garlic, add some ingredients to it, mix with the chicken, roll in tortillas, cover in sauce and bake. I originally started this with corn tortillas but they were so darn small that I went to taco sized flour ones. But for a twist, I took a corn tortilla and layered it inside of each flour one to give the best of both worlds. It added another layer of flavor that we liked well enough that I think I’ll do it like this from now on. These are creamy and cheesy and meaty with a mild bite but nothing too intense. With already cooked chicken, you can have dinner on the table in an hour. These are also large enchiladas so even though this makes just six, each enchilada could possibly serve two, depending on whom you’re feeding. Preheat oven to 350 degrees. Grease a 13×9 inch pan (I prefer glass for these) Pour the vegetable oil in a large pan. Add the onions, garlic and jalapenos and saute over medium heat until the onions are soft and limp. Add in one can of the chopped green chiles. Add in the chicken, Mrs, Dash seasoning and white chicken chili seasoning. Stir well to thoroughly mix. Heat the tortillas for 45 seconds on high in the microwave. They should be hot and pliable. If not, put them back for up to 30 more seconds. Lay one corn tortilla on top of a flour tortilla. Top with one sixth of the chicken mixture, then top with about 1/4 to 1/3 cup of the cheese. Fold over as tightly as you can (it will be full, so don’t pull too tight or you’ll bust it) to wrap and lay, seam side down in the prepared time. Repeat this five more times to get 6 enchiladas. Set aside. In a medium pan, melt the butter. Sprinkle the flour over it and mix well. Slowly whisk in the chicken broth, slowly being the operative word or you’ll end up with lumps. When you have all the broth stirred in, cook over medium heat, stirring constantly, until mixture bubbles and thickens. Add in the remaining cheese and second can of chopped green chiles. Stir in the heavy cream and sour cream and whisk to combine. Pour the sauce carefully over the enchiladas. Bake at 350 until hot, lightly browned and bubbly, about 30 minutes. Serve with cilantro, salsa or picante sauce and more sour cream if desired. 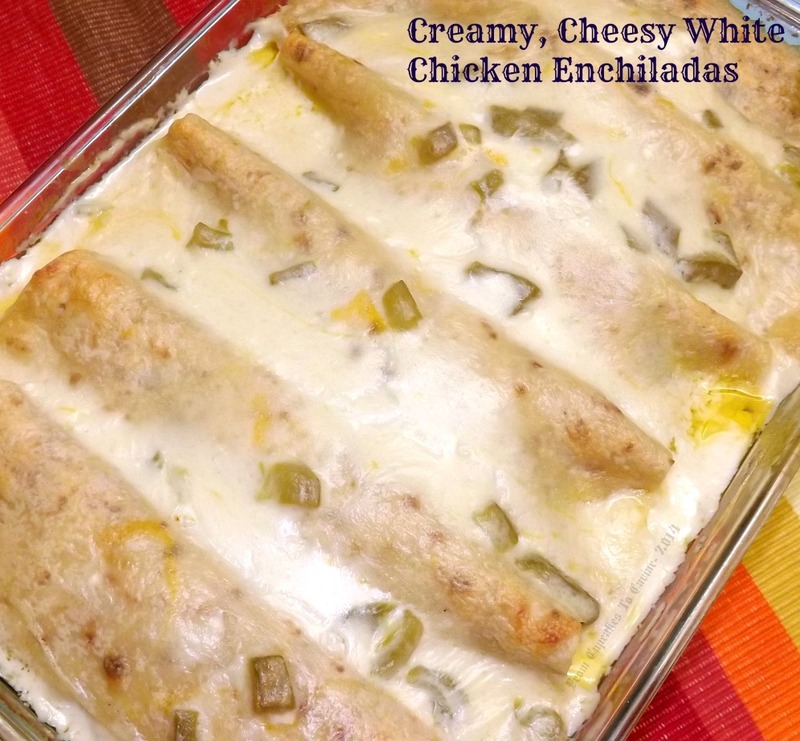 This entry was posted in Casserole, Cheese, Chicken, Easy by Janet. Bookmark the permalink.